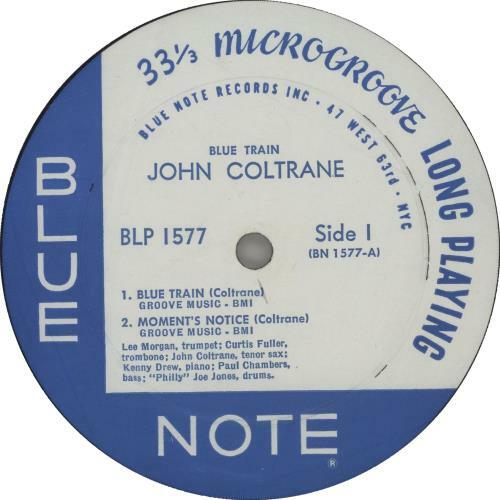 JOHN COLTRANE Blue Train (Very rare circa 1959-60 US issue of the classic 1957 5-track deep groove mono LP on the Blue Note West 63rd - NYC address label, a beautiful condition second variant with 'Inc' & 'R' label lettering, raised edge, RVG stampers & 'ear' markings in the run-outs. Also features Lee Morgan on Trumpet, Curtis Fuller on Trombone, Kenny Drew on Piano, Paul Chambers on Bass & Philly Joe Jones on Drums, pasted picture sleeve with 'West 63rd' address & Chapell import sticker on the back. See 'more info' for further details on this all-time masterpiece... BLP1577). With 'Inc' & 'R' lettering after 'Blue Note'. Deep groove with '47 West 63rd - NYC' address. 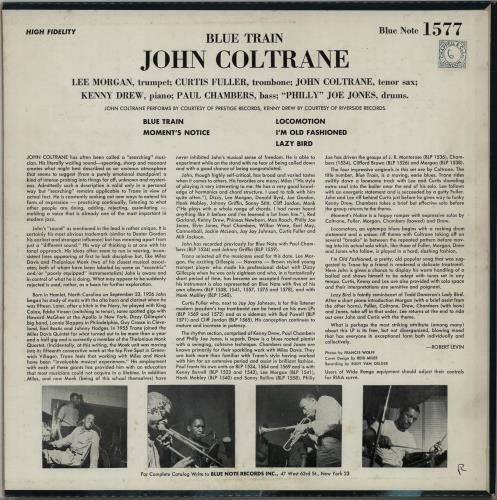 This beautiful second variant collector's copy was pressed just after �Blue Note Records� became an incorporated company & a registered trademark. The same fine sound as the 47W63rds pressings without the 'INC' and 'R' on the labels is present. We have play tested this record & the sound is immense, no doubt coming from an early batch of the second run with stampers originating from the same Matrix/ mothers as the original 47W63rds previously mentioned. A combination of Van Gelder�s sound engineering & Plastylite pressing [with or without the 'R'] is well & truly the 'golden age' of highest quality, Blue Note pressings. We should start by saying, we have never seen a copy as nice as this before, sleeve & vinyl wise. Obtained from a one previous owner collection, with all records bought from new at the time as exotic imports in the UK, the heavyweight pasted laminate sleeve is in beautiful shape. Clean, with no splits, rich colours & all text clearly legible. The Chappell import sticker is still intact on the back top right & there is just a tiny 'R' letter annotated bottom right. The sleeve easily meets an excellent condition grade. It really is stunning. The colours of the labels are bright and vivid with no tears to the print. There is a 'deep groove' visible both sides & a raised edge. From a collector's standpoint, a flat edge is more desirable but in terms of sound quality there is little between a flat & raised edge pressing of these original monos [we have found & play tested both in our time]. There are some very light spindle marks to indicate play but nothing of any real consequence. 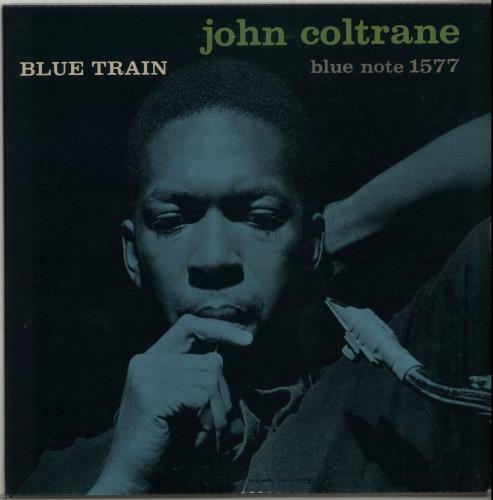 Trane's lone Blue Note release is an acknowledged masterpiece. This one should not be missing from any jazz or serious music collection for that matter. Trust us, you won't be disappointed!